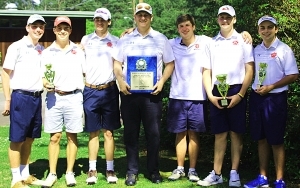 Dunwoody, the 2018 DCSD Boys’ Champs, finished 14th in the Class 6A State Tournament. The Dunwoody Wildcats could not make up any ground in the second round of the Class 6A Golf Tournament at Jekyll Island to slip to a 14th place finish. Sitting in 12th place after the first round (321) on Monday, the Wildcats looked to repeat their second round surge from 2017 for a top 10 finish but finished at 322 to wrap up a team total of 643. Patrick Caiaccio was the most consistent Wildcat in the tournament shooting 79 both days to finish with a 158 good for a tie for 46th in the individual standings. Jackson Perry and Nick Trembath (2018 DCSD Champion) tied for 60th as both shot 161. Perry had a first round 82, but followed it up with a 79 on the second day. Trembath dropped off from a first day team best of 78 to an 83 in the second round. Elijah Dwoskin finished in a tie for 68th with is 163 total from rounds of 82 and 81. Cole Pickering finished in 79th with a 167 (83-84) and Ben Warren lowered his score two strokes in the second round to tie for 80th with a 168 (85-83).